The acromion process is the bone on the top of the shoulder that is the attachment site for the trapezius muscle and the deltoid muscle. It is a bony landmark that “wraps around” the shoulder from the scapula bone. There are ligaments that attach and support the shoulder that attach to this bone and stabilize the shoulder joint with movement. 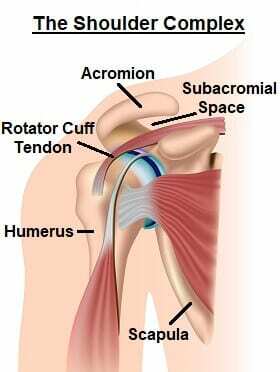 The space below the acromion bone and above the humeral head, is called the subacromial space. Within this space, and between these bony structures, we have: rotator cuff tendons, the long head of the biceps tendon, a bursae and the coracoacromial ligament. Subacromial impingement occurs when the subacromial space is reduced and which causes the humeral head, when elevated, to move closer than normal together to the acromion. There are many different types of reasons or pathologies for this condition. The most common include: rotator cuff strain, tendinopathy, or rotator cuff partial or complete tear, bursitis and calcific tendonitis. Any abnormality to these structures can cause pain and “impingement” syndrome. Of all the shoulder pain complaints that come into Dr. Nicholson’s office, Impingement syndrome accounts for about 50%. The acromion can be categorized into 3 types or shapes, and determined on x-ray or MRI. Sometimes the “type” is caused from “spurs” which are caused from repetitive movements and irritation within that subacromial space. To diagnose this condition, Dr. Nicholson evaluates in the office and occasionally will obtain advanced imaging, such as an MRI. Rest: Resting the injured joint is the first step to reduce swelling and pain. Be sure to keep using the arm gently. Keeping it immobilized can lead to a painful condition called frozen shoulder. Ice: In the first 24 hours of an injury, ice it to reduce swelling and pain. Heat: After 24 hours have passed, a heating pad or hot compress can help. NSAIDS (non-steroidal anti-inflammatory drugs): Reduce pain and swelling through NSAIDS such as ibuprofen (Advil), naproxen (Aleve), or aspirin. Physical therapy and exercise: Gentle exercises and stretches designed to strengthen the muscle can treat many rotator cuff injuries. Steroids: Cortisone can be injected directly into the bursa to reduce inflammation and pain, but steroid injection should be used under the careful direction of a doctor. Multiple injections should be avoided. If conservative treatment fails after about 3-6 months, Dr. Nicholson may recommend an Arthroscopic Subacromial Decompression. Dr. Nicholson will use small tools to access the joint and clean up the pathology causing pain. This is a minimally invasive procedure that does not involve a repair, escalating recovery time. This surgery is performed outpatient and typically requires about 5 days in a simple sling followed by formal physical therapy between 8-12 weeks. Estimated complete recovery to return back to light duty is between 6-8 weeks and full duty between 3-4 months.